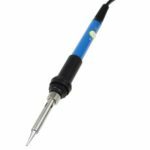 MINI TS80 is a smart soldering iron powered by USB Type-C interface and QC3.0 standard. 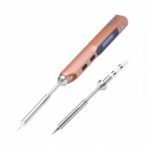 It is a portable and easy-to-use electric soldering iron adopting the internal heating working mode with accurate temperature control and fast heating speed, reach the set the temperature only few seconds. 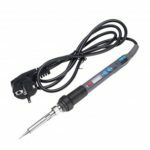 With OLED display, it can be easy to control the status of the soldering iron. With USB Type-C interface and QC3.0 standard, it can be powered by charging plug and power bank that meets the QC3.0 standard. 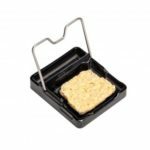 Adopting an internal thermal ceramic heating core that transfers heat to the top of tip quickly through a pure copper thermal part. 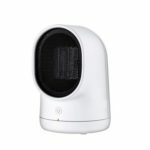 Embedded STM32 processor chip enable you to update the firmware or parameter setting via computer and control the temperature intelligently, it also has automatic sleep and power off mode. 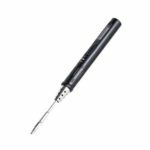 Compact pen shape with CNC machined aluminum alloy shell, easy to handle and carry.